Providing you with quality gear that catches you more fish, we have searched the stretches of the earth to source only the highest quality materials. The abalone paua that is used in our inserts has a high gloss finishing to give it additional reflective properties underwater and this is made in the South Island of New Zealand, the skirts we use are all handmade in America and we use brass leader tubes in our lures as they last longer than plastic alternatives. All Red Spectre Game Fishing Lures have individual serial numbers located in the head and the Red Spectre team draws random serial numbers for prizes on a regular basis that all Red Spectre (keep an eye on our new Facebook page for draw results). 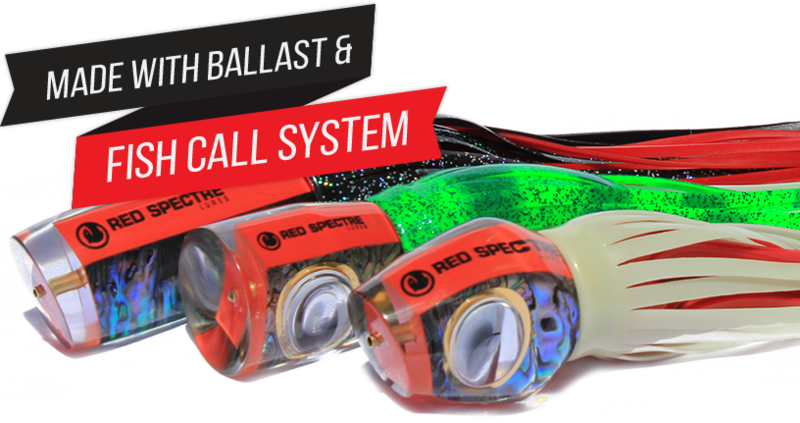 All Red Spectre Game Fishing Lures have our Fish Call system in the heads, this system provides an extra attractant to game fish sending out a vibration that predators sense and draws them in to the spread. They are also all keel weighted that ensures they run and track well through the water. Helping you make the right decision when buying from us, all our Game Fishing lures include underwater footage that shows you exactly how each of our lures performs underwater. Remember, every time you buy a lure from us, we will donate five dollars towards conserving the numbers of fish in our oceans so that you have a better chance of hooking up.